Going to so many paint and drink events inspired me to start painting at home. The fabric / craft store has pre-stretched canvas and acrylic paint sets. 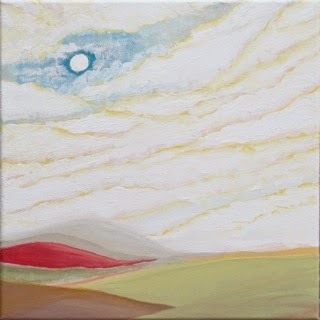 I started with the econo-pack of 12x12 canvases and a set of basic paints including primary colors, black and white. Then when I see a sale or have a coupon, I go back for more canvases and more paint colors. I seem to go through white and yellow the fastest. I like acrylic paint because it dries quickly and I can hang my masterpiece on the wall the same day. 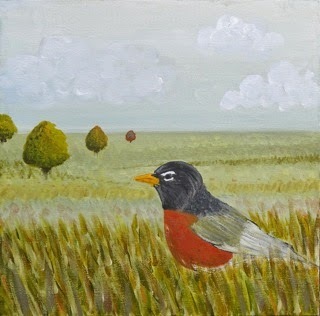 I wanted to capture the pretty rust color on the Robin in a painterly style. It turned out with the Robin looking way more linear than I intended. And he looks irritated. And then I had no idea what to do with the rest of the picture, so I did Bob Ross happy little trees. The end result cracks me up. I do like the colors, though. Here's one that I never really finished. Maybe this is where all my white and yellow paint went. I had this idea of this amazing sky, and then once I got into it, I couldn't really make it happen and I lost sight of what I was even originally going for. I think the quick drying property of acrylic paint worked against me since I was trying to do lots of blendy things. I like putting a ton of paint on the brush and having 3D blobs on the canvas. So maybe I'll need to try painting with oils eventually? I still might go back and try to make something of this "golden sky" painting later. Here's another where I was trying to do blendy blobby paint moves and do something not so literal. I actually like the trunk and the ground, but I hate what I did with the leaves and flowers. If I ever get some more skills, I'd like to do something different with the leaves. It's also possible I'll decide I like the whole thing later. For a while, I was setting up my paint projects on the dining room table, but it was a pain to set up and clean up each time. I was using an old picture frame to prop up the canvases. 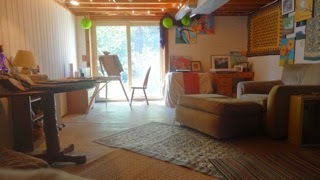 Then I got a proper easel for my birthday, which motivated me to create a little studio in our basement. This beach painting makes me happy. I'm not sure if those are flowers, or what's on the beach. Piles of happiness. 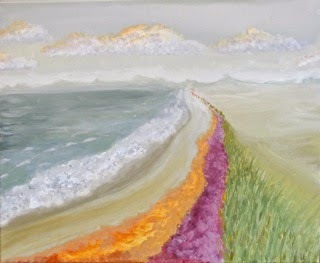 If we moved to the beach and I painted beach paintings all day, that would be fine with me. This one's not my favorite, but people say they like it. And by people I mean my mom. Maybe because there is some depth to it? I'm okay with how it turned out, but I prefer a lot of open sky I guess. I love the colors on this one and I got the smeary paint effect going on. And again, a lot of sky and clouds. 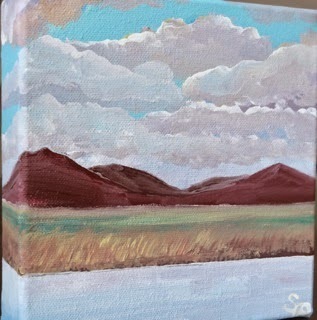 If I just want to paint 100 pictures of sky, clouds, and trees, is that lame? 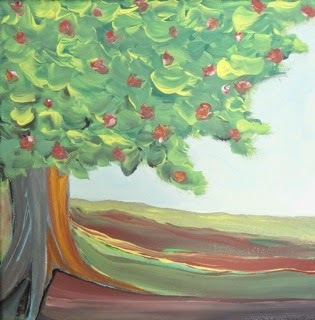 Look - this is the painting I used to create my title picture on this blog. 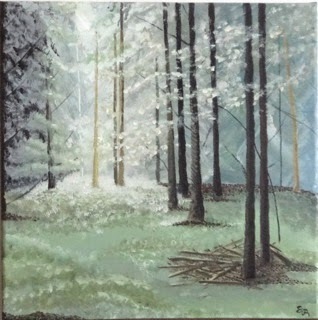 What draws you in to like a painting? The colors? Subject matter? Linear / realistic looking, or visible brush stroke / painterly style? I really like the same tree picture your Mom does. if you guys arm wrestle, I'll give the winner the painting ;-). Actually, some sort of word battle btw you two would be epic. Boggle battle.